U.S. stocks advanced on Friday, rebounding from Thursday’s biggest selloff since May as Wall Street cheered a solid June payrolls report. Labor Department officials said the economy added 222,000 new jobs last month, topping projections of 179,000. Also positive, revisions for April and May added another 47,000 jobs. A rise in the work force participation rate pushed the headline unemployment rate to 4.4% from a 16-year low of 4.3% and the U-6 underemployment rate to 8.6% from 8.4%. Wage gains disappointed somewhat, rising 0.2% versus a 0.3% forecast. Following a repeated see-saw trend, investors once again bought the dip, with Friday gains led by technology and consumer discretionary shares, and the NASDAQ 100 recouped around three-quarters of Thursday’s near 1% pullback. Although the July 4th holiday-shortened week ended slightly positive for equities, there were fireworks in the fixed-income markets. Global bond prices slumped, sending yields notably higher after central bank leaders in the U.S., Europe and Japan stand poised to implement less accommodative policy initiatives. For the week, the S&P 500 inched +0.14% higher, the Dow Industrials added +0.30%, and the MSCI EAFE (developed international) fell -0.47%. The June jobs report, published last Friday, reaffirmed that the U.S. labor market remains healthy. Nonfarm payroll growth of +220k was stronger than expected, and while the unemployment rate ticked up to 4.4%, the increase can at least in part be attributed to a rising participation rate. Despite this compelling evidence, however, the legitimacy of the unemployment rate is frequently questioned. Thankfully, J.P. Morgan has corroborating evidence. The JOLTS report, which comes out for May this week, should show the highest reading in job openings – over 6 million by consensus estimate – since the Bureau of Labor Statistics began tracking them in 2000. Moreover, as this week’s chart shows, the most recent Conference Board consumer confidence survey points to improving sentiment around employment, with the number of participants describing jobs as plentiful far exceeding those who say jobs are hard to get. 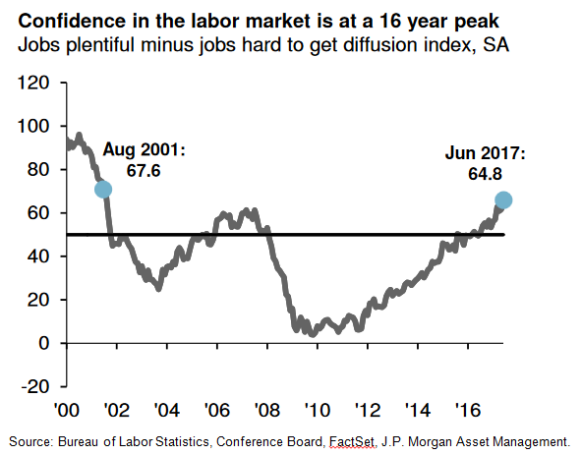 In fact, the June reading of this gap is at its highest level since August 2001, indicating that Americans are unusually positive about the job market. All in all, J.P. Morgan continues to see a labor market with little slack and, though wage growth remains weak at 2.3% year-over-year, investors should expect upward pressure on wages in the coming quarters.